Oh how I love working with Bernat Roving! 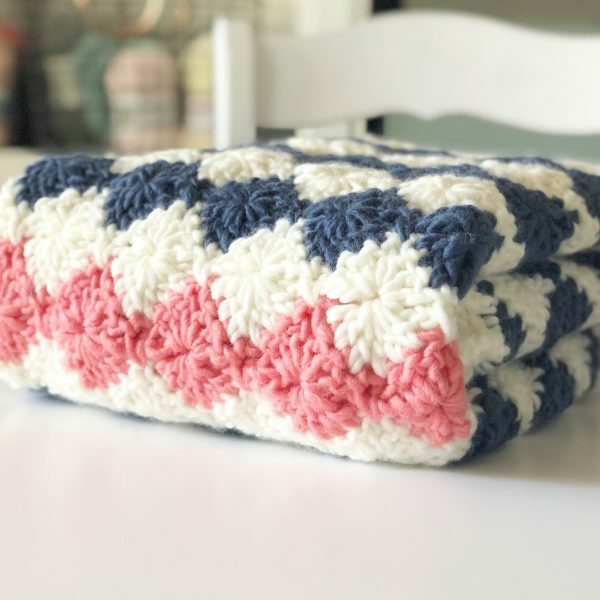 It made this blanket turn out so fluffy and soft! It’s a chunky yarn and once I was very comfortable with this Harlequin stitch, it worked up very quickly. I’ve previously shared the harlequin stitch and made a simple hot pad using it. After I finished that project, I was inspired to try the stitch using some Bernat Roving I had on hand, and I was not disappointed. Several of you have emailed me wondering how this yarn washes up. I only have hand washed it and laid it out to dry and I had no problem. The label does recommend hand wash only. However, it is 80% acrylic and 20% wool, so I would guess it might be okay on a delicate cycle in the washer, but I’d still lay it out to dry. Let me get to the pattern and then I’ll put some more details about different yarn options you could use. Finished blanket size: Approximately 34 x 34 inches. Row 2: CH 3 and turn. Skip first SC, DC3Tog over next 3 dc, *CH 7, skip 1 ch, DC6Tog over next 6 dc (leaving the sc between unworked), repeat from * ending with DC3Tog over last 3 dc, 1 DC in the top of the last ch. Row 4: CH 4 and turn. Skip first dc, *6 DCtog over next 6 dc (leaving the sc between unworked), ch 7, skip 1 ch, repeat from * ending with ch 3, 1 SC in top of the turning chain. One thing to note: I carried the yarn up the side where I could. I am NOT suggesting you do this. I wish I would have just cut the yarn and wove in all the ends afterward. When I went to put the ribbed border on, I wasn’t happy with how some of the blue yarn showed through. Can you see my mistake? In the row above the coral, I accidentally added a full diamond and that created a whole extra diamond and made the blanket to start widening. I had to undo a full six rows. I wish I would have noticed sooner! I usually check my work after each row or two, but I got a little too confident and I paid for it! Only a couple hours lost, but oh so humbling! It’s so hard to rip those mistakes out, but it needed to be done. After you have woven in all the ends, we are going to work the border one side at a time with front post and back post dc. If you do not know how to do this you can read about the stitch on my stitches account on Instagram. Working around a post of a DC (double crochet, US terms) will give you a ribbed look if you alternate the stitches and if you make sure each stitch pops out on the same side. You want each stitch to form a long line. This takes about 5 rows of back and forth. Work back across the row of DC you just made alternating working into the front post, and back post of each DC (FPDC, BPDC) When you get to the last DC, work that one as normal, into the top of the stitch. chain 3 and turn. 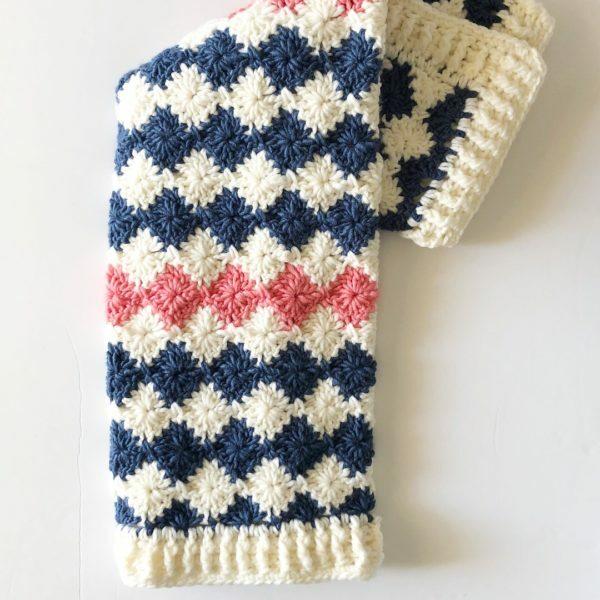 Work back across the same row with your alternating FPDC and BPDC matching each stitch to start making the ribbed look. Repeat this back and forth for 2 more rows for a total of 5 if you think to want it thicker, otherwise do not tie off, simply chain 3, and start working across the end of the blanket, working 2 DC into the sides of the DC stitches, again as evenly as possible. Chain three and turn and work back across in the same manner you did for the sides using the FPDC and BPDC. When you finish 3 or 5 rows, chain 3, and now work in the same manner up the side, again working DC as evenly as possible. When you finish working the ribbing up this side and then across the last end, chain 1 and work a SC into each DC all the way around the entire blanket. Tie off and weave in the ends. If you would like to substitute, I would recommend using a chunky weight yarn. However, what is giving this blanket a modern feel to me is the roving part of this yarn. Can you see how it is not twisty? It’s a brushed look. But I understand if you want to use a yarn you are very familiar with. 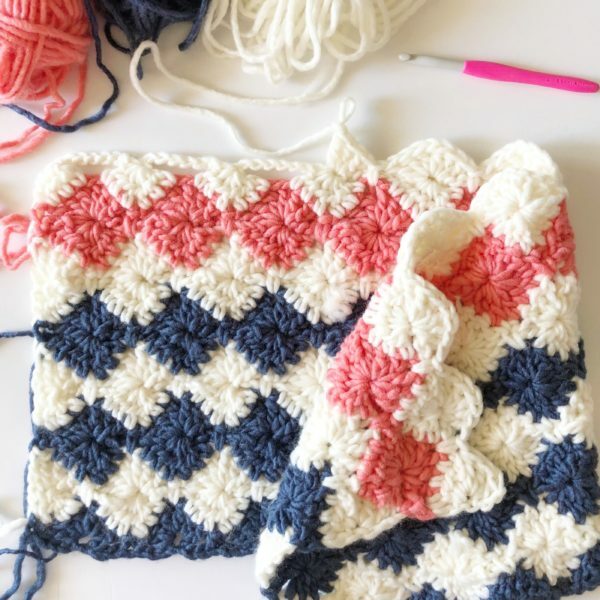 If you are a beginner and choose something like “I Love This Yarn” from Hobby Lobby or any of the Caron One Pound, you will definitely want to use the pattern repeat and make a longer chain. I love to share your completed blanket! 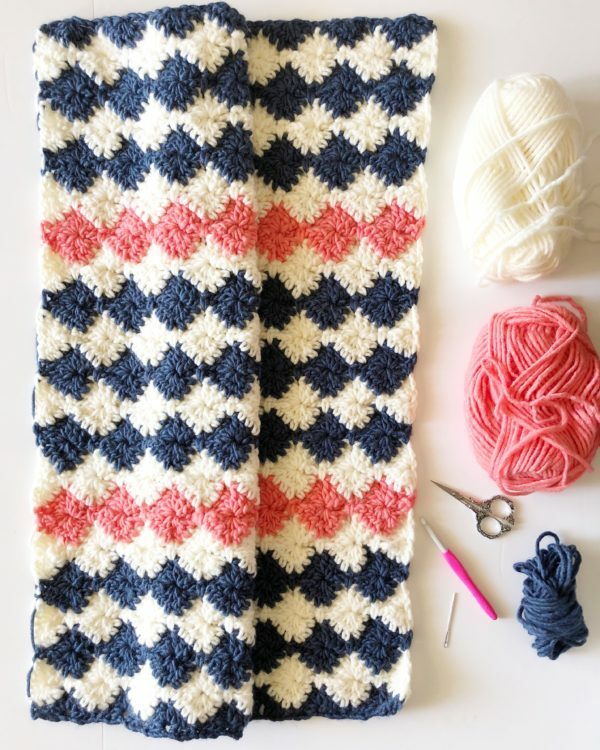 Enjoy making your classic crochet harlequin blanket!